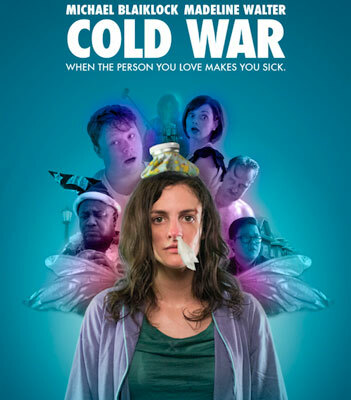 Cold War is a delightful - and insightful - look into the fearful abyss of taking a romantic relationship to its ultimate edge and seeing if anyone survives the carnage. Jon and Maggie are the intrepid lovers who finally decide to move in together. Jon, the sloppy sweet optimist is over-the-moon happy about this new level of commitment, and is only too content to sooth Maggie’s doubtful nature. Eventually Jon catches Maggie’s symptoms and their romance becomes as cohesive as oil and water. Michael Blaicklock and Madeline Walter shine as the infected duo, with Blaicklock getting the lion’s share of memorable one-liners and delivering them like a pro. But Walter’s Maggie is a perfectly wound-up coil of neurotic ramblings, threatening to spring out of control. The supporting cast of Antoine McKay and Gail Rastorfer as their married friends, the Galoups, add just the right touch of gloom and doom to the general mayhem. The obvious metaphor that Cold War is tickling our funny bone with ends up as a universal joke we can all laugh at, because we’ve all been there and survived - with mixed results.